SANTIAGO, CHILE – On April 8, 2014, AIPR’s Director for Latin America Eugenia Carbone participated in the Prevention of Genocide and Other Mass Atrocities Conference, a one-day event organized by theCarabineros de Chile, the uniformed Chilean national police force and gendarmerie. The conference was part of the institutional relationship developed between AIPR, the Chilean Ministry of Foreign Affairs, and the Carabineros within the framework of the Latin American Network for Genocide and Mass Atrocities Prevention. 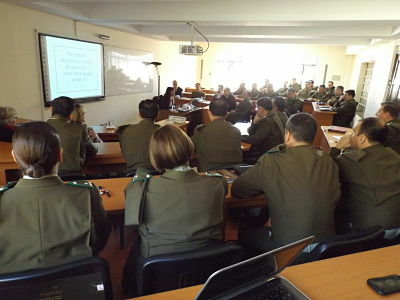 It was co-organized by the Carabineros’ Human Rights Department and its Academy of Police Sciences. Colonel Rodney Weber Orellana, Chief of the Human Rights Department, plus Colonel Marcello Palavicino Lasarte, Director of the Academy of Police Sciences, were among the many high-ranking officials in attendance. Such achievements are reflected not only in the progressive strengthening of the Latin American Network as a regional forum, but also in the national efforts towards training public officials, as well as in the implementation of national mechanisms and public policies on genocide prevention. Other panelists at the conference included Anna-Karin Gauding, Executive Director of the Chilean-Swedish Institute of Culture, who highlighted the humanitarian work of Swedish diplomats around the world, and Patricio Utreras, the Director of the Department of Human Rights in the Ministry of Foreign Affairs of Chile, who addressed the obligations assumed by Chile towards mass atrocities prevention. The conference’s closing session was delivered by Daniel Soto, Legal Adviser of the Carabineros’Department of Human Rights. He outlined the major aspects of genocide prevention, including its detection and its investigation, as well as the role of security forces towards preventing mass atrocities.